The aftermarket is already fully embracing the 2015 Ford Mustang. Vortech Superchargers will be heading to this year’s SEMA Show in Las Vegas to show off its supercharger kit for the 2015 Ford Mustang V8. Like previous supercharger offerings from Vortech for the Ford Mustang, there will be plenty of options for all performance needs for the 2015 model, from 640 hp to over 1,200 hp. 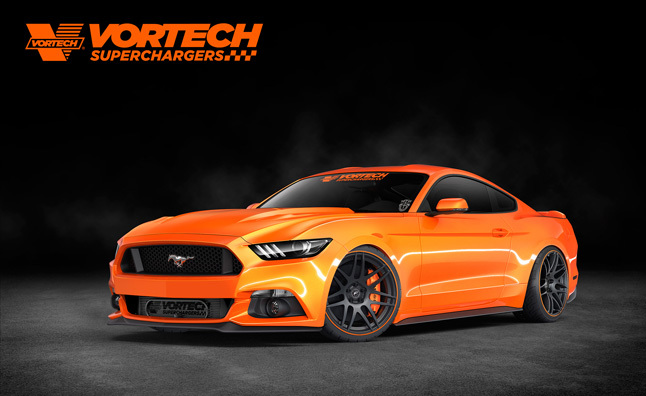 As for the vehicle that will be on display at SEMA, the Competition Orange sports car will feature Vortech’s V3si supercharger which is good for 640 hp and 485 lb-ft of torque. Other accessories finding its way to the 2015 Mustang include a Magnaflow exhaust system, 20-inch Forgestar F14 wheels, Steeds coilovers, a 3D Carbon lip kit and Baer Brakes. Join Sandy Springs Ford in showing support to our Nation’s Military Families, Monday 06/09/2014 at 5:00 PM in our showroom. 60 cities and making stops in 48 states. veterans’ organizations, military bases and race tracks, among others. otherwise would not be possible. This weeks hand-picked deals has something for everybody, from the High-Performance to the Highly-Economical. We have dozens of photographs of this heart-stopping Mustang Shelby GT500, Ford Focus sedan, and roomy Hyundai Elantra Hatchback/CUV, and they are all priced to sell quick! To see these and more of our stunning selection, point your browser to sandyspringsford.com, or come by our showroom. We have more than 700 New and Used vehicles available, and more are arriving daily. Disclaimer: Price is current as of date posted. All prices include rebates, incentives, and discounts. Add tax, tag, title and fees. Sandy Springs Ford is not responsible for any typographical errors in prices, descriptions, availability, etc. Been saving your pennies for a 2015 Ford Mustang? Put in a few extra shifts or some overtime? Got a great down payment ready? Well, however much you saved for your new pony car, start saving more – you’ll need the extra money to spend on tires. That’s because the Mustang will come with a system called Line Lock, which can lock the front brakes electronically, allowing drivers to perform big, dumb, smoky burnouts without moving so much as an inch. It’s sort of like launch control, only the average driver might actually use it.